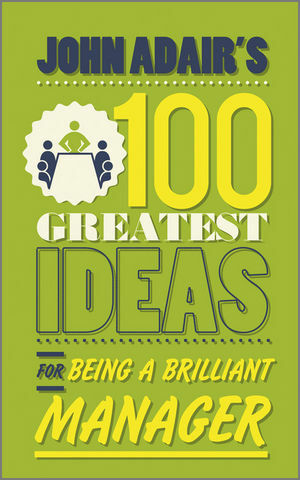 John Adair's 100 Greatest Ideas for Effective Management is the first in a new series of titles from the noted business expert. Focused on concise, practical, and straightforward business wisdom, the series offers the kind of real-world insight that business leaders thrive on. Short, punchy, and packed with real solutions, this book provides 100 proven and effective ideas for business managers, whether they manage a few people or a few hundred, and whether they work for a small firm or a Fortune 100 giant. For real management wisdom from a proven expert, John Adair's 100 Greatest Ideas for Effective Management offers everything you need to be your brilliant best. JOHN ADAIR is the business guru who invented Action Centered Leadership, now one of the best known leadership models in the world. Organizations worldwide use it to develop their leadership capability and management skills.